This comprehensive kit lets you cultivate three varieties of peppers. 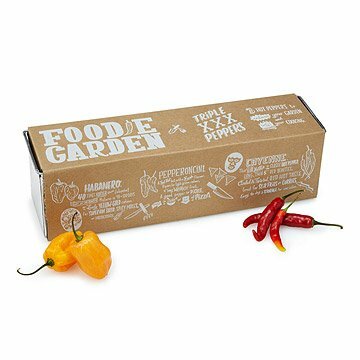 A great gift for gardeners and spicy food lovers alike, this comprehensive kit lets you cultivate three varieties of peppers. Featuring a stylish rectangular tin planter attractively packaged and enlivened with hand-drawn text and illustrations, the kit includes coco fiber growing wafers to start habanero, pepperoncini, and cayenne peppers. It also includes instructions for cultivating these fiery delights for sauces, pickling, pizzas, and recipes. Seedlings sprout in 1-4 weeks, and once started, can be transplanted to larger containers (inside or out) or to the garden to fully mature. Made in New Jersey. Kit includes pepperoncini, habanero and cayenne pepper seeds. Good to grow peppers if you already know a little about it. When the plants grow larger, they need to be transplanted into a larger pot. Not sure when is the best time of year to plant them or if they are indoor plants but we're giving it a try! I bought this for my grandmother's garden. My family and I love spicy food! I haven't planted yet, but excited to give these a shot. The box they came in and instructions are nice. My daughter and I had a very good time planting the seeds. She really loves watching the wafers grow into soil. We have them planted in our kitchen and can't wait to see the results. We really love spicy foods hopefully they will be plentiful.